The Entity is the sole survivor of a mysterious race who live in an underground city. 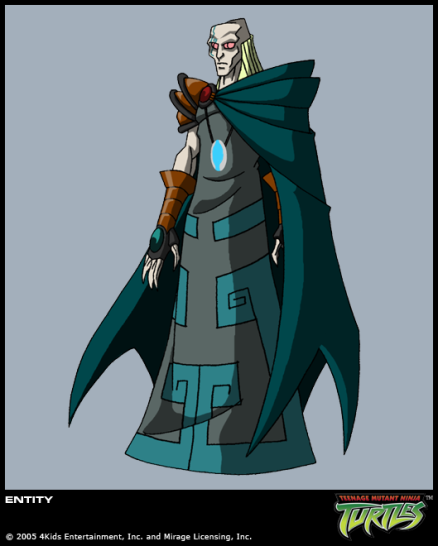 Using the power of his crystal amulet, he was able to control earth. He appeared in the 2003 TV Series. The Entity was a member of an advanced civilization that lived underground. When they discovered life on the surface of the Earth, they built an outpost to study it from, which later became the TurtleLair. However, they discovered that their race was dying. Eventually, the Entity was the only one left. When the Turtles and the Foot Clans mutant experiments enter his abandoned city, he captured them to turn them human again. However, in return, he demanded that everyone he cured had to stay as well as the Turtles. When the Turtles declined his invitation, he tried to keep them there forcibly. The Turtles were forced to use a light orb on him and encase him in crystal. When they returned to the city to cure the mutants, the Turtles discover an entire chamber of crystallized beings, meaning the Entity was lying. When the planets allined, the cosmic energy recharged the Crystal Moon, the Entity and his people were revived and ready to retake the world they once ruled. He sensed the Turtles’ return and created four lava monsters to stop them from interfering and then trapped them. He informed them that they will be the first slaves in the new order. But they managed to escape with the help of a rebel Y’Lyntianand disrupt her people’s attempt to raise Atlantis. The Entity presumably dies when the city was destroyed.